Going into designing my fourth theme for public use, I wanted it to be flexible and easy to modify like my second theme named Double Header. 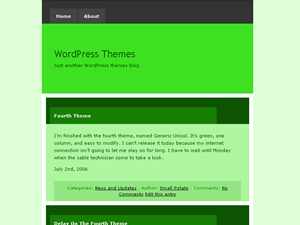 Generic Unicol is a green… really green, one column theme. It’s simple and plain because I left a lot of room for customization. What you’re getting is the basic concept.